This past Saturday was an exciting, emotional day for us in the Webster house. We were so thrilled to be able to witness Zenyatta’s 20th and final race. In between running out to the barn to do various chores, we kept our television set on from approximately 11 am that morning until the last race of the day in anticipation of catching even a glimpse of the dark bay Queen Z. It was phenomenal to watch Zenyatta break from the gates, fall back to last position, continue to be boxed out of the pack, and then come from behind with mud being slung in her face and a massive amount of track to cover in the last stretch to second place – with only a nose separating her from the leading horse, Blame. It was an intense, dramatic race that left goosebumps on my arms. I could feel my heart beating excessively, even after her final run was over. And I could taste the bitter flavor of defeat Zenyatta’s owners, jockey, trainer and groom were also undoubtedly experiencing at that moment. Despite the loss, I don’t think anyone can, or should, deny Zenyatta the immortality she deserves in racing’s history books. But for me, the most emotional part of Saturday didn’t actually come during or after Zenyatta’s race – it came a few races prior to Queen Z’s appearance in the paddock. Since we have our hands pretty full with a large operation of reining and working cow horses, I am not able to always keep up to speed on the world of horse racing. And had it not been for Zenyatta, I may have never even heard of a little brown mare named Goldikova. 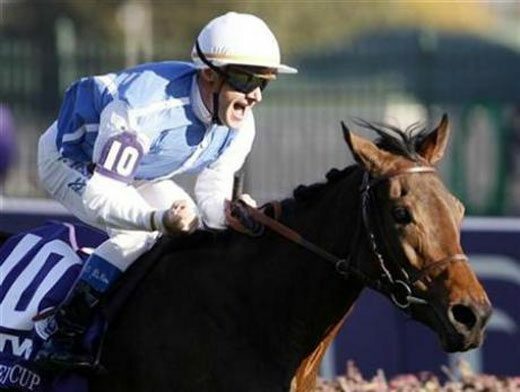 Goldikova wins an unprecedented third title at the 2010 Breeders Cup. Sired by Anabaa (who traces back to Northern Dancer) and out of the mare Born Gold, Goldikova is currently a 5-year-old mare. She was foaled in Ireland but now, her training is based out of France under the tutleage of Freddy Head and is ridden by jockey, Olivier Peslier. She has an impressive record of 15-3-2 from 21 starts, in a career that began in September 2007, and has 12 group one races to her name along with eight victories over males. She has raced in Europe and in the United States. Goldikova won her Breeders Cup race this past Saturday by 1 3/4 lengths. It was her third Breeders Cup win, making her the first Thoroughbred in history to win 3 BC titles – all in the Mile, against male rivals. Watching her race was thrilling, but watching ESPN film Goldikova’s groom on the sidelines was, to me, what the joy of horses is all about. Take a look at this Youtube video and you’ll see what I mean. It’s not the best footage (I was shocked when I could not find any more coverage of this emotional moment in racing), but you’ll get the gist of what I’m talking about. It gives me goosebumps every time I watch it…. This is what it’s all about. Another point of interest – in this race, Goldikova beats Gio Ponti, who was the runner-up to Zenyatta last year. The Usual QT takes third and Paco Boy, takes fourth. Paco Boy has lost to Goldikova for the fifth time in his career. Now retired, he will never beat her. 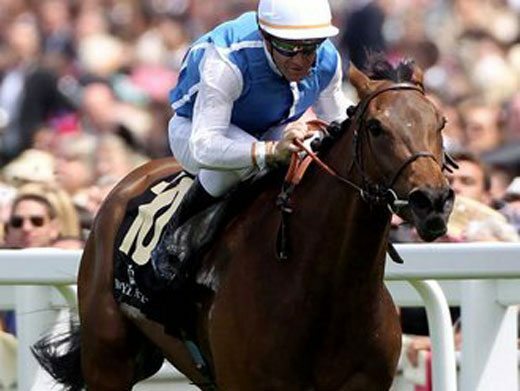 According to the media, Goldikova will stay in training for 2011 and try again for a fourth victory at the Breeders Cup next year. Yes, Goldikova’s groom reaction was very amazing. He sure loves the horse that he takes care of. I cried when I saw this that Saturday.